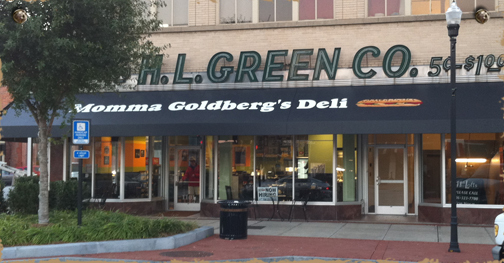 Momma Goldberg's Deli is located in the heart of Uptown Columbus, GA in the center of the entertainment district. We are family and veteran owned and managed. Since 1976, Momma Goldberg's Deli has been serving fresh, steamed sandwiches piled high with premium meats and the finest ingredients. Columbus Momma Goldberg's serves up your favorite sandwiches, soups, salads and nachos in a fun and friendly atmosphere. We also have great catering options. We can arrange a 10 sandwich party tray for you, or serve up boxed meals (sandwich, cookie, and chips). 10% off with church bulletin.